I was slightly worried about missing the European soccer championship game that evening (Germany against Faroer Islands), but that game apparently was so bad that we surely had better entertainment value with our selection of all-star games! This relatively recent German offering includes many elements that I like: bidding, variable player powers, and fantasy. Well, the last element is really flavor only, as the game is rather abstract. Players collect gemstones - the first player to collect 7 different ones (or ANY 8) wins. Similarly to "Die Kaufleute von Amsterdam" there is only one token on the map - whoever won the last bid can decide where it moves next. The board is divided into various areas with 2 different gemstones initially (there are more than 7 different colors, with different total amounts in each color), there are also "cities" with 3 different gemstones. All areas apart of cities have one metal symbol (there are 4 different metals of which each player initially receives one each). In these areas it is only possible to bid with this specific metal, only in the city can you use all 4. There are also areas with pyramids, and areas close to the "big wall". 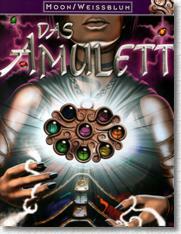 These areas grant you special abilities, if you have certain "power cards". The power phase is the most interesting of the game: each player has a stock of 10 energy markers that will either be "free" or bound to cards. As many power cards as there are players are drawn and auctioned off. The amount of energy that you pay not only beats the other players amount, it also defines how long you can use a card, as each round one or two energy markers (depending on the strength of the power card) are removed - if there are none left, the card ceases to function. Normally players will have from 2-4 "energized" power cards. Some of them let you draw specific metal cards each round, some of them make you select any metal card you want, some of them give you special bidding powers (for example forcing players to always bid at least 2 higher than you), some of them let you take energy away, etc. The abilities on the cards are varied and interesting, and basically through these cards the game is won. After the power bidding a number between 4 and 6 is drawn, this is the amount of movements the single pawn will make. At each stop the players bid their metal cards that fit the area (it is very often possible to bid with ANY card - if you have, for example, a power card that allows you to do just that in a pyramid space, for example). The highest bidder takes the gem of her/his choice. Then s/he decides where the pawn will move next. It is very interesting to watch what gems other players have acquired so far, as it is often possible to move the pawn to a space where the leading player (preferably) will get a gem s/he already owns, thus making victory more difficult. But again, beware of the power cards, as some of them can move gemstones on the map! The game is over pretty quickly, or rather more quickly than you wished for ("what, already? I wanted to win!"). It makes you want to play again immediately, which is always a good feature in a game. Probably not an evergreen, but a very nice and deep game, with elegant mechanics and nice material. I thoroughly recommend it, though non-gamers might have to get used to the rather nebulous fantasy theme. 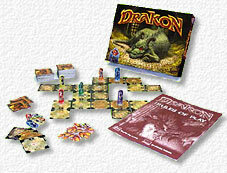 Diesmal zwang ich die Kollegen, das nicht so unglaublich geschätzte "Drakon" doch noch einmal auszuprobieren, diesmal mit einer kleinen Regelvariante (geliehen von "Carcassonne"): Es liegen immer 3 Dungeon-Tiles offen aus: wenn man nachzieht, wählt man sich ein Teil aus! 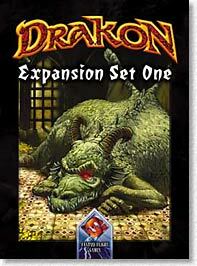 Das hat 2 Vorteile: erstens besitze ich die erste Auflage des Spiels, sah aber nicht ein nur wegen des Expansion-Sets die ZWEITE Auflage des Spiels zu kaufen (in der 2. Auflage haben die Dungeon-Tiles eine andere Rückseite, die nur mit der 2. Auflage kompatibel sind, was ein normales "Ziehen" unmöglich macht). Zweitens kann man die gerade ausliegenden Dungeon-Teile noch mal Allen erklären, was bei diesem zwar simplen, aber durch die vielen unterschiedlichen Effekte der Räume doch recht unübersichtlichen Spiel nicht schlecht ist. Noch mal kurz worum es geht: 2-6 Abenteuer versuchen aus einem Drachenverlies zu entkommen, das sie während des Spiels selber erstellen. Der erste Spieler mit 5 Goldstücken gewinnt (anscheinend ist es nicht so wichtig, WIRKLICH dem Dungeon zu entkommen- "reich stirbt halt glücklich"). Fast alle Räume haben einen bestimmten Effekt, der nur beim Betreten wirkt, man bekommt Geld, dreht Räume, teleportiert durch die Gegend, klaut anderen Geld, usw. (es gibt unglaublich viele verschiedene Räume). Mit dem Expansionset kommt noch ein lebendiger Drachencounter (der beim Betreten bestimmter Räume durch die Gegend bewegt wird) hinzu, der vor allem andere Spieler ärgert (go back to the beginning, lose 1 gold), außerdem ein gutes Dutzend neuer Raumeffekte durch neue Tiles. Durch die oben beschriebene Regelvariante wurde das Spiel kürzer und schmerzloser, und der sonst stark empfundene "Kingmaker"-Effekt trat schwächer als sonst zutage. Kein supertolles Spiel, aber mal ganz nett zwischendrin. Das Glücksmoment sollte man allerdings sehr hoch einschätzen! "Im Zeichen des Kreuzes" lets the players reenact the horrible crusades - as crusaders of varying reputation. The game is played on a map of the Mediterranean. Each crusader starts with a handful of armies and treasure chests in predetermined areas. 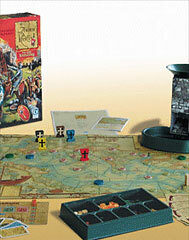 The goal of the game is to reach Jerusalem, which, at the beginning of the game, is fortified with 15 armies (more will be added during the game). There are also two independent pirate and land armies each, which mostly serve as an annoyance for other players. Movement works through playing region cards: there are 3 sorts (mountain, plain and sea) and a joker which can be used as any region. Some of the cards bear army or ship symbols - these move the neutral armies. There are an abundant number of both Christian and Muslim cities on the map, ready to be plundered. It is actually often equally good to attack Christian cities, as the booty is the same, but the reputation will suffer slightly (making you redraw less cards, which is bad). Christian cities also serve as places to pray (gain reputation) or to hire new armies (with treasure chests, presumably from the last ransacked town). Once a city is sacked, it is removed from the board and cannot be used again. Certain event cards force you to never attack a certain city to gain defined bonuses. After conquering a small number of Muslim cities it quickly becomes your duty to attack Jerusalem. Your first attacks will be hopelessly outnumbered, but the pope will give you new armies as a bonus, so next time you will be stronger. After probably 2 hours of play one player will be the first to conquer Jerusalem and win the game. Basically this is a racing game, not a war game. As battles mostly cost you the same number of armies as you will gain through plunder, so you will try to reach your quota of conquered Muslim cities and then proceed as quickly as possible to Jerusalem, to gain the bonus armies for your first attacks (which usually end in losses). A light, not very deep game, which still manages to project a reasonably detailed "historic" atmosphere. There are lots of opportunities for annoying the other players, which adds to the fun. Combat can become repetitive, but is rather quick, so it doesn't matter that much. It is also not important to win ALL battles - you have to win the RIGHT battle in the end. All in all this is a game that certainly will appear again on our table. But careful: Check if you have assembled the tower correctly before you start playing - we discovered we hadn't in the middle of our game, and this forced us to stop playing as many armies had become stuck in the rim and therefore created an unfair situation for some players without us knowing it! This is the German version of the excellent American card game "Slapshot", which, slightly inspired by the black film comedy with the same name about ice hockey (starring Paul Newman), became most known in it's old Avalon Hill edition. 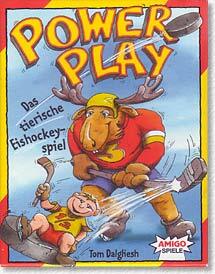 You won't find a Paul Newman card, but rather an assortment of fantasy and parody characters very removed from real ice hockey in the German version. Each player randomly draws a team of 3 attackers, 2 defenders and a goalie. Every turn each player has 3 options: 1) exchange one player card for a randomly drawn card of the same type (presumably in the hope of getting a better player). 2) Randomly steal a card of another player and replace it with a card of your choice from your own hand (risky, but worth it if the other player is known to have a strong team). 3) Challenge another players team (you have to challenge each other player before challenging the same player again). Who can score 5 matches wins the game. Games (or rather battles) work a little like the card game "War" - Each player selects a card secretly, the higher card scores a goal, with some special rules (goalies always stop attackers, or concede to the higher goalie, certain defenders have the ability to incapacitate the opponent's card, forcing him to exchange the card after the game, etc.). There are even players with "special abilities", like the "Hydra", which is stronger if played late in the game. All 6 cards are played and the higher scorer wins (sudden death continuation is possible, if there is a draw). Card play is relatively random for the first 3 cards or so, but becomes increasingly tactical, as you know what cards have been played and which ones not. Also, the other players will watch the game like hyenas - if a player is known to have a weak team the others will certainly take advantage of that knowledge. All in all this is a really fun game - it plays quickly, uses at least parts of your brain that other games do not use, and it is also cheap. A true classic, especially as a quick starter or light finishing game.